What are values and why are they important? Many of us were exposed to the concept of values at an early age. When we were taught the difference between right and wrong. We read books and listened to stories. We learned from the mouse and the lion that mercy brings reward. We discovered the virtues of hard work and planning ahead from the mishaps of the grasshopper. We realized the dangers of false alarm from the boy who cried wolf. As we grew into adult life our experiences and circles of influence further refined what we deem important and how to navigate through the unwritten rules of appropriate behavior. Once we entered the workforce, we were exposed to the influence of written values. We looked in admiration at these beautiful cards laying on our desks with graphics containing inspirational words describing the company culture and aspirations. The words and meanings seemed so simple and made so much sense, yet at the same time represented an intricate clue to, how we as employees, needed to behave. Values are a powerful tool to articulate what we stand for and believe in. They describe our unique offering to the world and provide us with a way to determine if we are truly fulfilled and living our best life. Our values are our moral compass we use to guide our actions, decisions, behavior, and priorities. When we are acting in alignment with our values then life is good, and we feel happy, satisfied, and content. When our actions are incongruent with our values then we feel discontentment and often resort to bad habits or behaviors as an attempt to feel better. Not having clarity around your personal values is a lot like going on a trip without GPS. You know there are roads that will lead you to your destination, but you aren’t completely sure which interstate is the best one to take. You either pick one and hope for the best, or you follow a couple other cars you hope are heading in the same direction. Without values, every decision is difficult, and you can become easily diverted from your end goal. You become vulnerable to being influenced by societal norms or peer pressure from your loved ones, or even worse, you will go on autopilot and live in a state of unawareness. What is keeping you from knowing your truest self? Is it the time or the mental energy needed to get clarity? Is “unplugging” or dedicating uninterrupted time a luxury you can’t afford? Or do you struggle with the abstract nature of the concept? Whatever your reason, I’m going to share with you a simple no-nonsense approach to help you identify your own core values. This method can be done quickly and incrementally, meaning you can put it down when life interrupts and pick it back up later. It’s so simple it can be done in the car waiting for your kid’s practice to end, in the 10 minutes before a meeting starts, or at the end of your lunch. All you need is a pen and paper (or tablet for the digitally savvy). Think about a time when you were happiest? Visualize where you were, who you were with, and what you were doing. Ask yourself what it was, in that time or moment, that made you happy. Reflect on examples in your personal life, professional life, or even your childhood. Was it a time when you persevered against all odds to achieve something you thought unachievable? Perhaps you were in the presence of the people you love the most. Or maybe you were on a great vacation exploring an unknown part of the world. Jot down the words that describe what you were doing these moments that made you happy. Don’t hesitate to free write and select as many words you can think of to explain what made you happy. If this is one of those times where you only have a few minutes to devote. Then focus on one example at a time and pick back up with another one at a later time. Now that you have a good list, it’s time to refine it by putting meaning to your words. The first step is to narrow down your list by clustering similar words together and select the best word that represents that grouping. For example, if you have the words “philanthropy”, “generosity”, “giving back”, and “community” then group those together and select a word that best defines what that cluster represents to you. Also, don’t forget to utilize a thesaurus or other resources such as Simplex HR’s Core Values List, because this is the part of the process where word selection matters. This refined list should contain the 8-12 words that give you a sense of pride and satisfaction. The last step focuses on determining what words will be contained in your personal moral compass. Compare each of the words on your list to one another. Circle the word in each pair that best reflects your truest beliefs. The words you circle should be moved to the top of your list and become your core values. Keep in mind this your compass to design. So if you can’t choose between two words then include them both. Or if you feel like something is missing, then add it. At the end of this exercise the words on your compass should instill a sense of pride. They should represent what you stand for, and should authenticate whatever decisions you face. After completing these 3 steps, you now have more clarity on your core values. The words that will be imprinted on your moral compass. These words represent who you are. Serve as your guide to ensuring your actions, decisions, and your life supports these values. 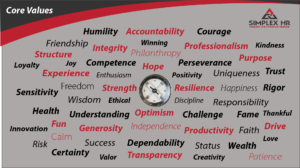 For additional resources on defining your values list Simplex HR's Transformation Tuesday Video Series. Go forth and use your compass to live the life you want to live! Shannon Stickney is a life and executive coach and the founder of Simplex HR; a coaching and human resources consulting firm committed to guiding and inspiring people. So, they can grow and achieve exceptional outcomes in their personal and professional lives.